Why over 400 schools want to work with us. Who are Hackney Learning Trust? Set up in 2002, we were the first private, not-for-profit company in the UK to takeover and transform a council’s entire education function, and we are proud to say we did just that. Spurred on by our vision to improve the life chances of all our children and young people in the borough, in 2012 we became a department in Hackney Council’s Children and Young People’s service. We have continued our legacy of achieving great results. Currently 95% of primary pupils, 99% of secondary pupils and 100% of special school pupils attend an outstanding or good school. We have over 500 professionals working across 24 specialist service areas, ranging from Early Years to post-16 support. Our teams include ex – Headteachers, curriculum experts, specialist consultants, and school business and administration professionals. Whether helping to improve literacy, embed curriculum changes or prepare for Ofsted, our School Improvement team are at the forefront of our organisation with an excellent track record of delivering results. We offer both fixed and tailored school improvement packages in developing leadership and management and raising educational standards through effective teaching and learning. Our full range of high quality and efficient Business Services such as HR, Finance and IT means leadership teams can worry less about the day to day logistics and focus on the long term outcomes. With a passion for education and innovation, we now work with schools and educational settings across England. 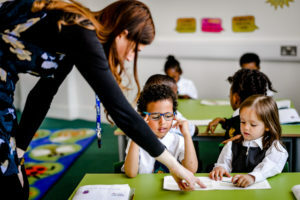 We have leveraged 16years of experience of working with Hackney schools to deliver outstanding results to proudly support schools all across the country. We offer our services to Early Years, Primary, Secondary, Colleges, Independent Schools, Academies and Post 16. We are a not for profit organisation with a passion for education. We are focused on improving life chances rather than profits. Whilst our services operate independently, several can work together as an integrated team so schools achieve much greater value. We are experienced in making rapid improvements, sustaining achievement and developing innovative ideas. You can give us a call, drop us and email or visit our website.